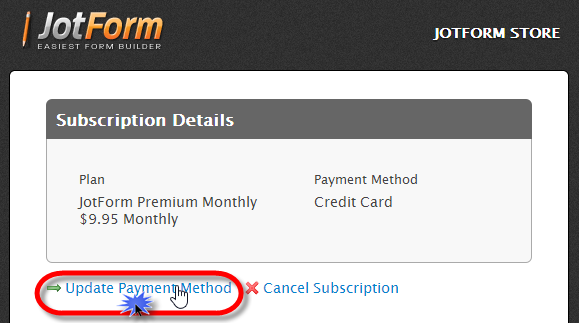 How do I change my payment method for my subscription? (2) Next Click on " Edit " in the Payment Method section. (3) Now click on " Change Credit Card " to change your credit card information. (4) This will take you to the JotForm Store, then click on " Update Payment Information ", and enter in your new Payment Details then click on Update Payment Information again to confirm it. Kindly open a new thread on your own so we can better track the issues and solutions users are having. Anad address it properly.